So the bill — designed to keep criminals from getting information about people who own guns today — has resulted in a major loss of access even to records from long, long ago. A bill to add a five-year time limit is now pending in the Legislature and could come up for a first consideration as early as today, and the Virginia Genealogical Society has asked us all for our support for 2014 VA HB 100 offered by Virginia Delegate Scott Lingamfelter. I urge you to support HB 100 of Delegate Scott Lingamfelter, now before the House Militia, Police and Public Safety Committee. This bill will cure an unintended consequence of prior legislation which has denied researchers access to Virginia historical public records going back to the 1700’s. The Library of Virginia has had to withdraw 222 reels of microfilm from research access. Local clerks have been compelled to deny researchers access to county order books and indices from the 1800’s. Please cure this barrier to genealogical and historical research in Virginia by passing HB100. Unfortunately, both the blog post and the email version of the blog post turned the email addresses of the legislators assigned to the House Militia, Police and Public Safety Committee into code that many readers couldn’t use. So if you were one of those readers, and didn’t join in this important fight because of the address issue, here’s another try at a list of the Delegates on the committee to contact to urge them to support HB 100. What you’ll need to do is copy and paste the paragraph into a text editor and then replace the (at) characters with the at symbol — @. 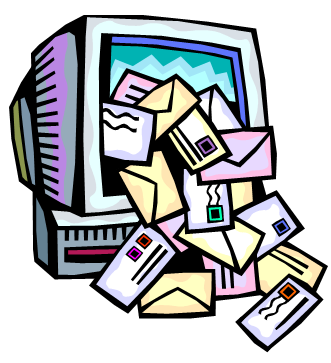 THEN copy and paste the paragraph into your email program address box. And if that doesn’t work… let me know and I’ll try, try again! Having all of our voices heard in favor of open public records is too important to be defeated by a coding glitch! It sure won’t be too late, Ange. This won’t happen overnight in any case, so we all should have a chance to be heard. When I rec’d a nice note from Delegate Webert’s staff, I sent back an email telling why this legislation is so important to family historians/genealogists, from a personal point of view and giving permission to Delegate Webert to read the note to the committee. This is the reply I rec’d. Thank you for including this information. We have seen quite a large outpouring of support for this legislation. I am happy to pass this along to Delegate Webert for his review. At this time, he favors the legislation. I received a response from Delegate Webert’s office also. Please keep us informed of any progress. Thank you for taking the lead. We won in the Assembly Committee but need support now in the Senate. There’s a post up today on contacting the Senate committee members. Isn’t this is a clear violation of the Freedom of Information Act? I sure wish it was! No, these are state records so they’re covered only by state law, not the federal Freedom of Information Act. And although Virginia has its own Freedom of Information Act, it is allowed to exempt records from public access and chose to do so with these records. And the US Supreme Court isn’t being helpful here at all — it recently held that a state can limit its freedom of information act to its own residents and nobody else! So much for federal law trumping state then. It only trumps state laws on certain subjects. Minor little matter of the 10th amendment (“The powers not delegated to the United States by the Constitution, nor prohibited by it to the states, are reserved to the states respectively…”).